Seminole cattle program maintains upward trend | Seminole Tribe of Florida, Inc.
A brangus bull is led by a cowboy Nov. 21 to a cattle transport truck after being sold at the Salacoa Valley Farms Fall Bull and Female Sale in Fairmont, Georgia. A business lunch featuring tender and juicy rib-eye steaks from the Tribe’s own cattle ranches gave a clue for news to come Oct. 29 at the 11th annual Cattle Owners Summary. Overall, the business of beef in Seminole country is up and rising, said Alex Johns, Natural Resource director and head of the Tribe’s cattle program during the midday meeting at Big Cypress Community Center. Johns reported highs and lows of the business starting at 2004 when the Tribe began to electronically collect and share cattle data through the current 2015 fiscal year. The first electronic system – still used by the Tribe – allows the U.S. Department of Agriculture and cattle buyers to locate the origins and other initial data about individual livestock. Seminole Pride Beef’s additional electronic reporting system tracks the entire lifespan, health and locations of cattle destined for consumer products, like rib-eye steaks. The up-to-date cattle business cost summaries were produced via Cow Sense, a software program used at the Tribe’s cattle office to input data about cattle (age, weight, feed, location and other details) and then to extrapolate the information into business dollars. Among the report’s highlights is Brighton’s overall rise in profits from an average $82 per head through 2014 to $240 per head in 2015. In Big Cypress, cattle owners went from an average annual loss of $20 per head through 2014 to a gain of $251 per head in 2015. Recent industry decreases in feed costs and increases in beef prices further fueled profit, Johns said. On the meeting date, the combined Brighton and Big Cypress herds were roughly at 5,500 head. 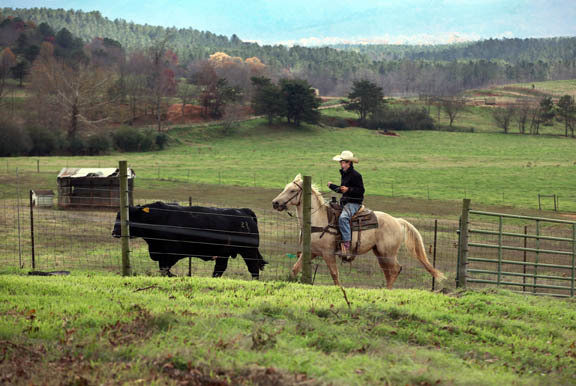 The Salacoa ranch operation in Georgia brings the Tribe’s cattle count to approximately 11,000. Cattle is also turning profit at the Georgia ranch where owners from Big Cypress to Texas traded hands Nov. 20-21 with nearly $1.5 million for 250 cows, calves and bulls at the Fall Bull and Female Sale. “But what is really selling here? Genetics,” said Rep. Frank, who purchased two cows at the event. Inside a barn at the top of the valley, buyers bid on the auctioned head, which was described before sales by sire and dam lineage, weight at calf age, current rib-eye ultrasound numbers, meat marbling score and other valuable science-based information. Sales ranged from $4,000 for a 6-year-old heifer to $20,000 for a top breeding “power” bull. The average cost per head was $5,942. Tommy Perkins, the International Brangus Breeders Association executive vice president who holds a doctorate degree in animal science/animal breeding and genetics, complimented the Salacoa sale. “This is the first bull sale I’ve ever been through that has this many circles around the IMF (rib-eye marbling score),” Perkins said. Executive chef Johnny Mitchell, who served Seminole Pride Beef for lunch and dinner at the events, said proof of superior meat is ultimately in the eating, but professional chefs can see, smell and feel the difference even before the beef sizzles. The income report of all Big Cypress and Brighton cattle owners showed all but three earned profit. The “break-even” number per pound per calf is $1.14. “Not many ranchers (nationwide) have an idea or guess of what their break-even number is. We know to the penny what we need to break even,” Johns said. Owners were provided with their own privately coded business analysis to keep secret or share within the network of other ranchers as needed or desired. Stanlo Johns, of Brighton, said much has changed in Seminole cattle ranching since he began nearly four decades ago. “Then, about 69 people owned 5 to 25 head each. Today didn’t just happen. We made it happen,” Stanlo Johns said. Currently, the Seminole cow/calf operation ranks seventh in the nation, according to the National Cattlemen’s Beef Association. Goals to ensure the Tribe’s continued success and individual owner profits were also outlined at the meeting. Johns asked owners to set sights on keeping herds 80 percent calves and 15 percent replacement heifers; maintain an average cow age of 7 years old; bring calves to average wean weights of 625; keep one cow per 2.75 acres of pasture; and produce 190 pounds of beef per acre. He reminded cattle owners that the largest and always increasing cost on cattle farms will continue to be feed, fertilizer and land maintenance – even as calculations put Seminole ranching costs consistently below the national industry average.